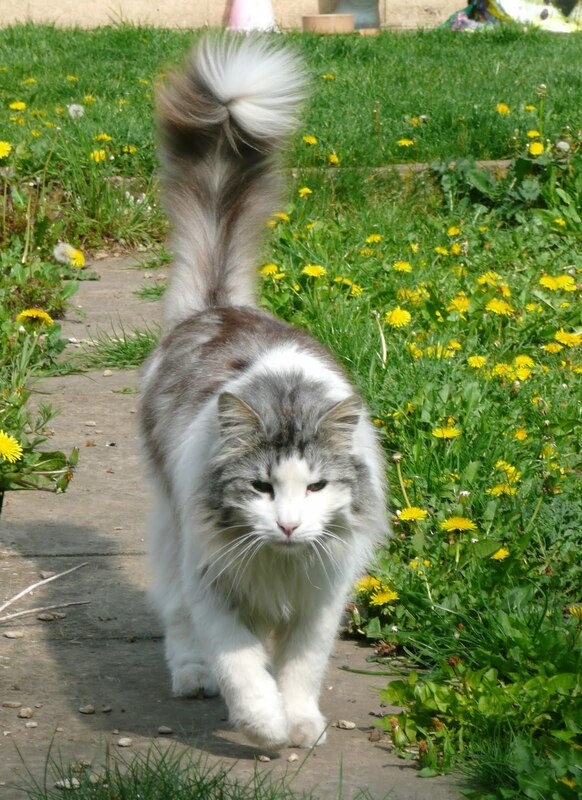 who goes by the name of Loki (but has been sweetly nicknamed Lucifer by the people next-door! ), I got to see some of them yesterday, when he raided a dunnock nest and killed two chicks (well, we’re hoping he’d killed the first before my sister’s spaniel pup stole it and ate it! We took the second one off him while it was just about still alive, because we didn’t think the pup needed any more snacks! It died shortly afterwards). The parents hung around to protest for a very long time (they were still calling this afternoon), but have hopefully moved on now. I don’t know if it is early enough in the season for them to raise a second clutch (and of course they would have to move their nest away from our garden!). Dunnocks are very interesting little birds with very inventive love lives, but their offspring are obviously very boring, because all the internet would tell me about dunnock nests is that they often play host to cuckoo chicks. Which we don’t have around here. I am slowly increasing my abilities in birdsong recognition, and can now add dunnocks to the repertoire, thanks to yesterday’s little escapades, as well as house sparrows. So, having figured out how much (or how little, as the case may be) progress had been made on the foreign bird mount collection in the past, this week I was ready to get down to work and start curating some birds. One shelf of pigeons was fully documented and photographed, and we made a start on the next shelf, containing parrots, including a beautiful glass case of 5 birds posed on some artfully arranged vegetation with a lovely painted background. I even managed to identify a couple of birds that had no data on them, by comparison with other specimens (only the obvious ones. For example, there were two birds labelled as crested pigeons (Ocyphaps lophotes), and a third with no label that looked just like them. As there are no other species of crest-bearing pigeon with which it could easily be confused, it was a fair assumption that they were all the same species). It’s a good feeling to be doing some real curatorial work, and to be able to do it – it’s a great boost to the confidence to be given a job and then left to get on with it, knowing what I’m doing and not needing supervision! It’s not very glamorous, though…many of the specimens are very old and covered in nasty substances (arsenic, mercury, methyl bromide, who knows what else…), so we have to wear lab coats, gloves, and gas masks when handling them. It’s not a good look. The masks are really uncomfortable, and a bit hard to breathe in, but I suppose it’s better than inhaling lots of arsenic dust! For the benefit of my non-museum readers (which is probably a good half of my readership of about 10 people! ), I suppose I should explain exactly what I’m doing, because museums are rather odd, esoteric worlds to those not in the know! When an object enters the museum (e.g. through a donation/purchase/bequest) it is given an accession or entry number, and a form is filled out with details of what it is, where it was collected and who it came from (if these details are known). Often a group of material will be acquired in one batch, and the objects will all be given the same accession/entry number. Each item is then given an individual and unique register number, and the details of the specimen will be recorded in a register book (or on a computer database – some museums no longer use paper records much). There are recognised standards for the documentation of museum material, and the most basic standard requires that records include: what a specimen is, where it’s stored within the museum, and that both the record and the specimen bear the register number (so that you can find it again, obviously!). However, over time information about specimens may be lost (Bristol Museum, for example, lost both a lot of information and a lot of specimens in WW2 when the museum was bombed), or the specimens may become disassociated from any information about them, or accessioned material may never get as far as being registered. Many museum collections include material that is variously: fully accessioned and registered; accessioned but not registered; either of the above but the information has been lost/disassociated; lacking any data at all. Each shelf of foreign bird mounts is decanted, and the birds are sorted into those that already have register numbers attached to them, and those that don’t. For the ones that have register numbers, it is simply a case of checking that their records and labels contain all the same information, and that the information is correct. The ones that don’t have register numbers are given shiny new register numbers and all of the information available on each specimen’s label (if there is any) is entered into the register book. If they have no information, they are still given a register number but just have to go into the book as, e.g., ‘unidentified parrot’. A label is attached to any specimens that don’t already have one. Every specimen is then photographed (making sure the register number is visible in the photo so we can match photos to the correct specimens later), and checked for any evidence of pest damage. The shelf the birds came from is cleaned, and the birds returned to the shelf, in taxonomic order where space allows (with the prettiest ones to the front to impress visitors to the store!). All of the records, and the photographs, will eventually be transferred onto the computer database, where they will be searchable via the internet. Once the whole collection is documented, they will then be sorted properly into taxonomic order (they are currently roughly in order, but somewhat mixed). This is important because it makes specimens easier to find when they are in a recognised order. There are other systems for ordering collections used in museums (including alphabetical), but taxonomy is a more useful system because it puts related species near each other and more findable if, for example, someone requires members of a particular order or family for research. I think the first time I properly realised that I know NOTHING about birds was 3 years ago, while on a trip to Australia…thanks to some lovely people pointing out every new animal that appeared in the garden of the house I was staying in, within a week I could identify by sight and sound around half a dozen birds. And I wondered if I’d be able to do the same with British species (the answer: probably not). While I can identify many mammals by sight (and by skull these days! ), I have never paid much attention to birds. Which leaves me, as a vertebrate zoologist, with a large black hole of ignorance surrounding a good chunk of the animal kingdom. And nobody likes having a large black hole of ignorance (and yes, I’m aware that’s a crappy metaphor…physicists, please don’t write in to complain). However, I didn’t do anything about this distressing lack of knowledge for a couple of years…years spent being generally too busy to worry about birds. But in the last few weeks I have found myself with the spare time, and the motivation, to take action. The spare time has been helpfully provided by my lack of a job, and the motivation by my voluntary work at Bristol Museum: I was recently drafted in to help two apprentices catalogue the learning and handling collection, which consists mostly of British mammal and bird taxidermy, and found myself unable to identify to any useful level (“Some kind of duck” being not particularly helpful!) many of the bird mounts. So with my trusty Bill Oddie guidebook (that I bought with the best of birdwatching intentions while living in Glasgow last year, and never used) and my shiny new monocular, last week I started trying to identify the birds in my garden (not that there are many – I have 2 cats); seemed as good a place to start as any. 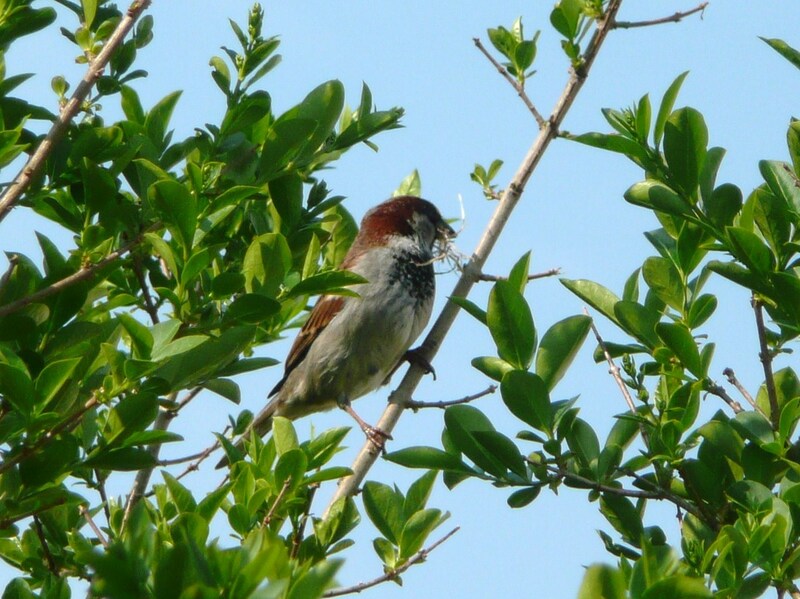 My first victory was over the birds that nest in the neighbour’s roof and flit about in my hedge – Bill Oddie helpfully identified them as house sparrows (which I’m aware are common as muck, but I didn’t know what they looked like! EDIT: Apparently they’re no longer common as muck, and are in fact now on the Red List of threatened species due to a drastic population decline in recent decades. They’re certainly not threatened around here!). Next task: Learn to identify birds by song as well as sight, because I may never be able to see all the small twittery things that lurk in the bushes, but I can certainly hear them! Yes, folks, this website really exists. Some of it is not for the faint of heart, but the fur-bearing trout, mouse pope, and Utah werewolf are particularly enjoyable. And of course there are inevitably lots of pictures of the Brewdog squirrel bottles, and the ubiquitous assquatch. Have to say I am fairly dubious about the panda, it doesn’t look real (thankfully). Bad taxidermy is always something I find quite sad (and sometimes downright horrifying! ), because that animal has died for nothing…just to become a cautionary tale in how NOT to stuff something. I’ve seen plenty of examples in museums, particularly amongst the older specimens (there were lots of amateurs just stuffing dead things willy nilly in the 19th century). Monkeys must be unusually hard to get right, because I have seen many terrible examples. It’s the face that seems to be the difficult part, because they often have the most terrifying grimaces. But then, I think I’d be grimacing too if I was shot and stuffed! My favourite piece of crappy taxidermy that I have seen belongs to the Hunterian Museum in Glasgow, and is a porcupine’s arse mounted on a board like a trophy head. It just looks so comically pathetic. Unfortunately they don’t seem to have the matching head, or I’m sure it would be on display, mounted on either side of a wall. "Is it a bird? Is it a plane?…Oh wait, it is a bird"
So, after a few weeks spent helping some apprentices in the learning department of Bristol Museum catalogue and identify the learning and handling collection (which mostly consists of taxidermy), and feeling like a fairly useless zoologist at times (“Umm…it’s a bird? Possibly a house martin?” (it wasn’t, it was a sand martin, but I was damn close! My bird identifying abilities are somewhat patchy. I’m working on that – I even bought a monocular (never really got on with binoculars) and Bill Oddie’s Birds Of Britain And Ireland (What else? The man was a Goodie, he’s a living legend!) to be able to go out birdwatching)), I am now back to my usual routine of Tuesdays in the Biology department (wow, that was a long sentence! Possibly a record even for me). And I get to do some real curatorial work! Not that most of the stuff I do at the museum isn’t curatorial (there’s always lots of cataloguing and ferrying around of specimens, moving things in and out of freezers, etc. ), but I now have my very own project to work on: I (and one other volunteer) will be responsible for the curation and documentation of the foreign bird mount collection. This was started in 2006 by the previous curator and a volunteer, and despite the project plan having a time estimate of 3 months on it, 5 years later it is still unfinished, stuck in Museum Limbo along with many other projects started by one curator and never completed after their departure. This seems to be a common problem in the museum world, and I suspect in many jobs: when one person leaves, there isn’t always a handover to the next person, or any documentation left to explain what they were working on and how far they’d got. It just isn’t always possible. But it does mean that, when someone eventually comes to pick up a predecessor’s work, they are left scratching their head trying to figure out what has and hasn’t been done. Which is what I spent most of yesterday afternoon doing! As it turns out, there is more work to do than we originally thought, but it is less daunting than it originally looked. Having found the MDA card catalogue for the collection, the relevant register book, and having looked through the cabinets to check the progress already made, I think I now have a workable system figured out for dealing with the documentation of the specimens. It’s just a shame that I can’t be at the museum full-time…it’ll take months on only one day a week, but I could probably get it all done in a few weeks if I was there full-time! But never mind. It feels good to be able to do some work that will be of real, lasting benefit to the museum: in (hopefully) somewhat less than another 5 years, they will have a beautifully catalogued, photographed, and taxonomically ordered collection of foreign birds!